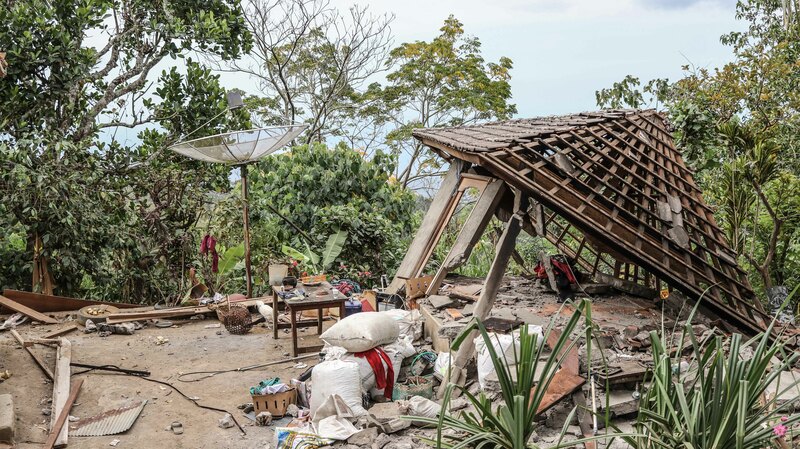 Wingkan, a forty-year-old mother in Sembalun Bumbung, East Lombok, was gathering with her family when a powerful 6.4-magnitude earthquake shook them out of their home on July 29. After staying in a temporary shelter for three days, they decided to move back home. But then three days later, a 7.0-magnitude earthquake struck the island in the evening of August 5, collapsing dozens of homes in their neighborhood. The tremor was so powerful that it was felt all the way on the neighboring island, Bali. Wingkan and her family are only a few of the 387,067 Lombok residents who are currently displaced from their homes after a series of moderate and strong earthquakes struck the island over the past two weeks. Based on data from the National Disaster Mitigation Agency (BNPB) as of August 12, the death toll has risen to 392. More than a thousand people are reported to be seriously injured and hundreds of thousands of buildings have been damaged. Over the weekend, Kopernik teams traveled to villages in Lombok and Bali to connect families with shelter kits comprising of tarps, mats, blankets, sarongs, solar lights, saws, crowbars, shovels, hammers as well as other much-needed supplies. On August 10, we distributed 100 shelter kits to households in Sembalun Bumbung village, East Lombok regency, including to Wingkan’s family. We have also delivered kits of basic supplies — including rice, cooking utensils, and tarps — to 56 families in Ban village, Karangasem regency, Bali who lost their homes due to the earthquakes. The need for basic supplies and necessary support remains high as hundreds of thousands Lombok residents continue to live in uncertainty. More than 500 aftershocks after the major quakes have been recorded in the area so far, leaving many in trauma as well as crippling daily and productive activities in the area. Kopernik will continue to respond to the urgent needs of those affected by the earthquake. We need your support so we can continue sending much-needed help to families in Lombok and Bali. Please join us in our efforts here.